So I’ve already written a post about how I went from 214 pounds to my current 160 (I’m tall, 5’7, and build muscle easily, so this is actually a healthy weight for me), for Healthy Tipping Point, but for the (never home)maker Health Living Celebration, I want to talk about how I became a runner. 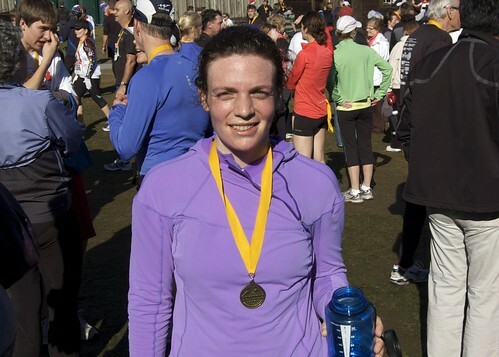 While learning to run happened as a part of my "journey to health," my love for running deserves its own moment in the spotlight, because in a way, in helped me more than losing 54 pounds ever did. Let’s back up to age 12. To those dreaded middle school years where girls either start getting gorgeous, or go from cute to, well, awkward. I went awkward. (Me too, Maissa!) What had been adorable as a kid (curly hair, chubby cheeks, and a healthy layer of baby fat), now turned me into an outcast, made even worse by my complete lack of sports-related-talent. I’m pretty sure I’m the only kid in history who got a note sent home saying I was failing PE because I refused to run the mile. When my mother confronted me about I replied that did complete the mile . . . I just walked it . . . in roughly 15 minutes. I hated running. I hated feeling out of breath, the burn, and the way it made my legs hurt. I hated how the kids in my class used to make fun of me as they lapped me over and over again. Yet, perhaps because running was my nemesis, I dreamed of being a runner. How amazing would it be if I became one of those long-legged gazelle types, flying across the pavement with an easy, breezy smile on my face as my ponytail swung back and forth? Running was a far off dream, something I would get good at when I finally managed to lose the weight. It was on that list. You know, the list. The one that includes all those things you’ll do after you lose the weight. My list included shopping at a normal store, buying a pair of designer jeans, and wearing a dress that came above my knees, and becoming a runner. Finally, after several failed attempts, I started to lose the weight and keep it off. I had lost about 25 pounds when I started running. I was working with a trainer at the time and he casually suggested that I try running for a fifteen minute stretch on the treadmill. If that felt OK, he continued, I should take a five minute walk break and then run for another fifteen. Apprehensive and excited I gave it a shot. I’m not going to pretend those first fifteen minutes were easy. My lungs burned. I think the treadmill was set to 4.5 mph (a slow jog, really), and my calves started aching almost immediately but I got through it. Then to my own surprise: I got through the next fifteen minutes. I felt euphoric. I was going to become a gazelle! Well, of course, that’s not exactly what happened. My stride is hardly graceful, and my hair is far too short to be pulled into a swing-y ponytail. What did happen, however, was: I fell in love with running. I remember the first time I ever ran for an hour straight. I finished out of breath and floating on air. For the rest of the day my face was covered in a stupid-grin. Around that time I decided I could probably run a marathon right? I mean running 26.2 miles when running one used to be impossible would be the ultimate tribute to my middle-school self. So I started small. On November 19th of last year I ran my first 10k. It rained, and it was windy. I was cold, wet, and I loved it. I loved the energy, crossing the finish line, making my time goal (under 1-hour, 59:44), getting a race shirt. The race bug bit, hard. So it only made logical sense that I turn my sites onto a half marathon from there, right? 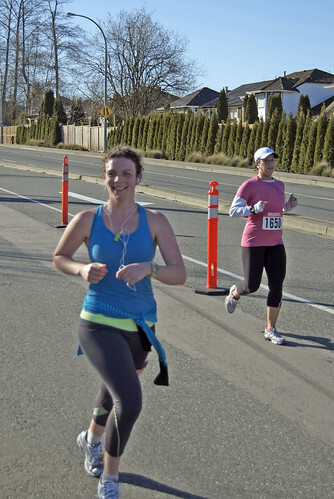 I ran the Fort Langley 1/2 Marathon on February 21st, and then turned around and ran the Vancouver 1/2 Marathon on May 2nd three minutes faster. Now I’m training to run the Victoria 1/2 marathon in under two hours (current PR 2:04:36) on October 10th. From there, I’m looking towards the Eugene Marathon on May 1st 2011. Yes, it is a long way off, but I love running too much to risk injury. I don’t really think my body is meant for running, I carry my weight in my hips and rear-end, and am prone to hip pain. I’ve never been injured, but I think that’s more because I know when to back off. So, I’ll build to the full slowly, so that when I get there I can run, not stumble, across the finish line (though a stumble-run will be acceptable). The truth is, since losing weight I’ve been able to successfully check off most of the things on my "what to do when fit" list, but few of them have provided the satisfaction I thought they would. In fact, none of them has, except running. A year and a half after that first treadmill jog, I’m still in love with running. That’s not to say getting out the door is always easy. Nor does it imply I never have a bad run. I have, trust me. I’ve experienced miles and miles on end of painful slogging, but it is all made worth it by those good runs. You know the ones I mean, the ones that are easy. Where you get lost in the movement and feel like you’re flying. Everything clicks and you just flow . . . I run for those moments. Because, rare as they are, in those moments I feel like that gazelle I always wanted to be.